I‘ve been a Detroiter for 60 years and this is the first time in my experience that so many different organizations with different ideologies and personalities have recognized that the time has come when we must join together to resist and defeat the growing counter-revolution. Rooted in race, and the search for the American Dream, it began at the end of World War II when white people moved to the suburbs to escape blacks in cities like Detroit where whites were becoming the minority. Taking with them their schools, their businesses and their taxes, they impoverished the cities and attracted the attention and money of extreme right-wingers like the Koch brothers. As a result, over the years the suburbs have become increasingly reactionary. They have elected governors like Scott Walker and Rick Snyder. They have passed anti-union right to work, anti-women, and anti-black “Stand your ground” laws, which have given men like George Zimmerman permission to kill teens like Trayvon Martin as if they were roaches. It is also mushrooming on college campuses. Professors are writing books celebrating Senator Joe McCarthy, claiming that his red-baiting witchhunts were actually early warnings against the big government that Obama is trying to force on us. Every year the ultra-conservative Phyliss Schlafly hosts a nationally-telecast Collegians Summit at the Heritage Foundation to provide these professors with a youthful audience. We have community events coming up. As a part of Riverwise Magazine’s community, we want to make sure that you and your friends aren’t left out. 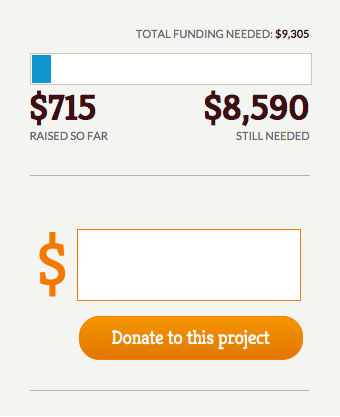 Also, we have 2 months to meet our ioby fundraising goal and we need your help! 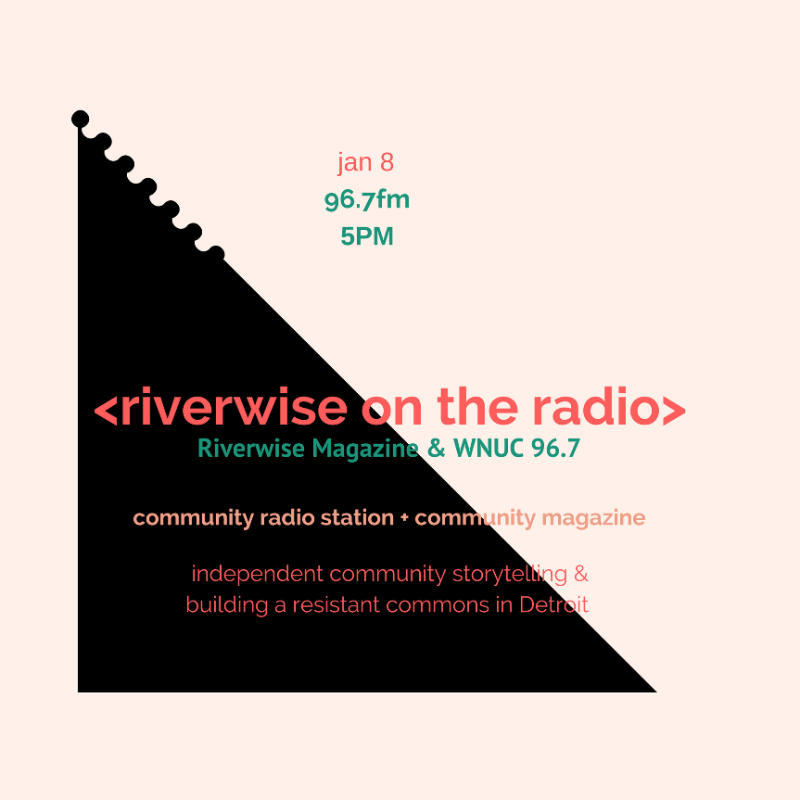 Tune in at 5pm on the 8th to hear Riverwise Magazine as we discuss the power and importance of independent community storytelling with our friends at Detroit’s community radio station, WNUC 96.7 FM. Listen at wnuc.org! 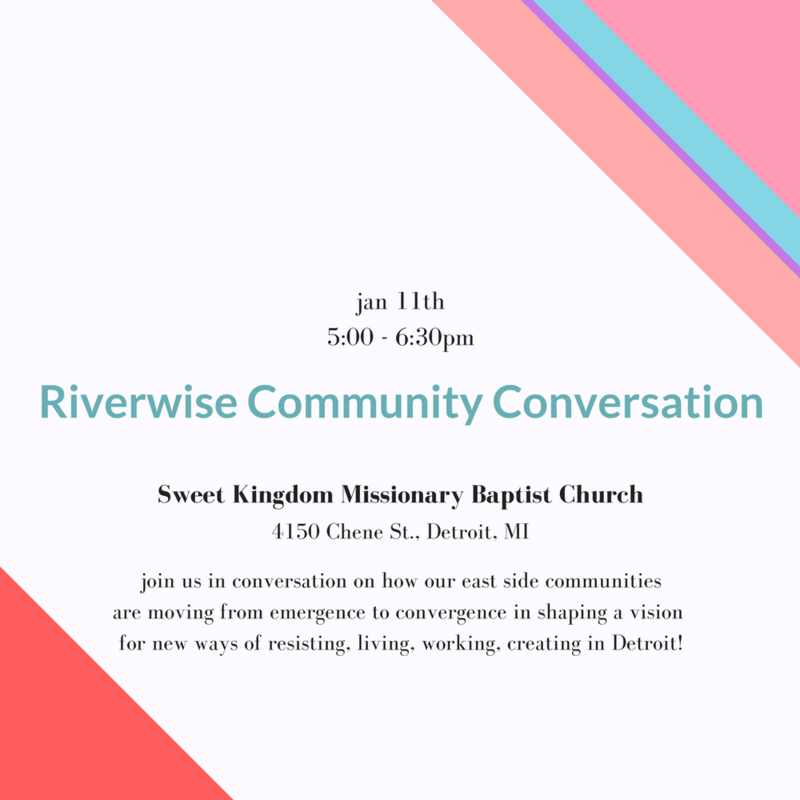 Join Riverwise Magazine and the Boggs Center in conversation with the community of Sweet Kingdom Missionary Baptist Church to talk about new exciting projects on Detroit’s East Side; together we are growing a convergent vision for a new way of living in Detroit. 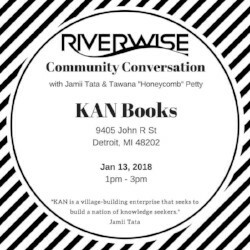 Join Riverwise Magazine for a community conversation on how we imagine, manifest, & sustain liberated spaces, partly in the context of Jamii Tata’s dope piece in Riverwise’s latest issue. Let’s meet our ioby fundraising campaign goal! To all who’ve contributed, whether by donating or sharing the info; thank you! Whatever you contribute, a donation in any amount and/or sharing the link brings us close to raising $9,000 to sustain artists, writers, all content creators, and the small team that supports contributors and relaunch our website as a resource of accessibility for our readers and community. Riverwise Magazine is growing our story-telling capacity, a digital commons, our community spaces, and growing voices of new vision for Detroit’s future; Riverwise’s growth includes you! Keep current with forthcoming issues, & growing digital commons on Twitter,Instagram, and Facebook! We’re growing community resources: a calendar, a conversation series, & a newsletter. Share info or announcements with us riverwisedetroit@gmail.com. Copyright © 2018 Riverwise Magazine, All rights reserved. You are receiving this email because you indicated that you love Riverwise. We love you, too! 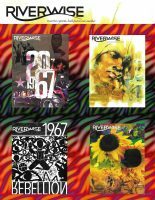 Riverwise Magazine is a collective effort to highlight and strengthen grassroots movement activity throughout the city of Detroit. Former staff members of the Michigan Citizen Newspaper alongside active members of the James and Grace Lee Boggs Center for Nurturing Community Leadership launched the magazine in 2017 with an eye towards reporting on emerging movements, especially among communities of color. Riverwise documents the people and places building a more equitable and just city. 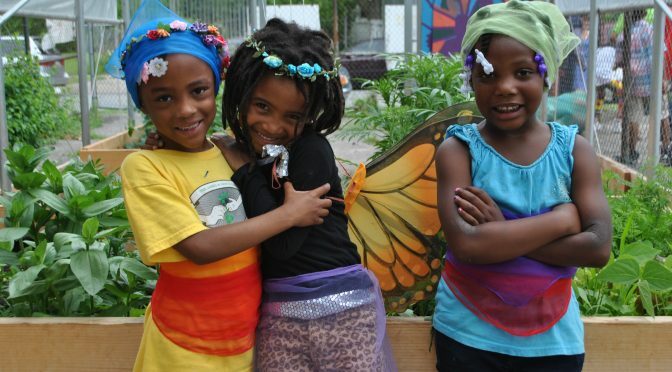 While government agencies lay down the red carpet for billionaire venture capitalists and corporate ‘tech’ headquarters, Detroit’s ‘underserved’ are projecting visions of a sustainable future. 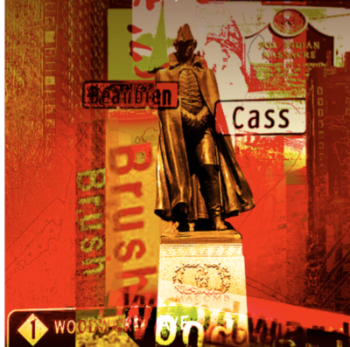 With a distribution of 10,000 copies a quarter, we are encouraging new ways of thinking about our city in coffeehouses, barbershops, community centers and bookstores. Our work has been supported by a generous grant from the New Visions Foundation and individual donations. We anticipate being able to maintain the current level of funding for basic production for the coming year but we have depended on the volunteer work of authors and artists. We are now calling on you, our growing readership, to help us support local writers and artists working with us to tell these remarkable stories. 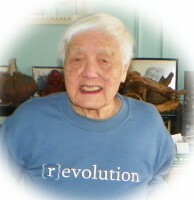 Their unique insights and abilities are essential to projecting new ideas and propelling us towards a more humane world. Our commitment to expand the traditional role of a community publication is paramount to the mission of Riverwise magazine. We provide an independent, visionary voice about the challenges facing our city and our country. This campaign is one step towards aligning our funding structure with the communities we seek to engage. Riverwise will use your donation to support writers and artists. We will broaden our call for submissions’ to writers and artists and offer a stipend for published work. These stipends will be allotted according to our quarterly publishing schedule which currently falls in the first week of months, February, May, August and November. We will also encourage visionary activists who don’t consider themselves ‘writers’ in the traditional sense to develop stories based on their activism within grassroots communities. Within many Detroit communities, activists are struggling to cope with a myriad of state-induced crises. Water shut-offs, rampant mortgage and tax foreclosures, school closures and other injustices have ravaged historically stable neighborhoods. The response by local government support has been to continue providing tax breaks and other advantages to the wealthy in a fevered attempt to quickly inject investment into specific, favored regions in the city. Neighborhoods that need support and the most have been left to fend for themselves. Drawing on a history of “making a way out of no way,” people are developing visionary solutions to not only survive, but thrive in a city based on values of compassion and care. Documenting these stories is critical to expanding the consciousness of everyone about the kind of changes we need to create a better future. With your help, we hope to support for writers and artists who have dedicated their lives to telling the stories of people making a real difference in our communities. Riverwise has initiated this campaign to help support writers and artists who have engaged in fighting these issues directly, or have committed themselves to telling the stories of those who have responded with visionary and empowering programs. 2017/18 Riverwise Magazine Harvest Edition! 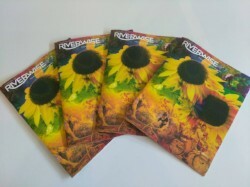 Riverwise’s latest edition is out around town! 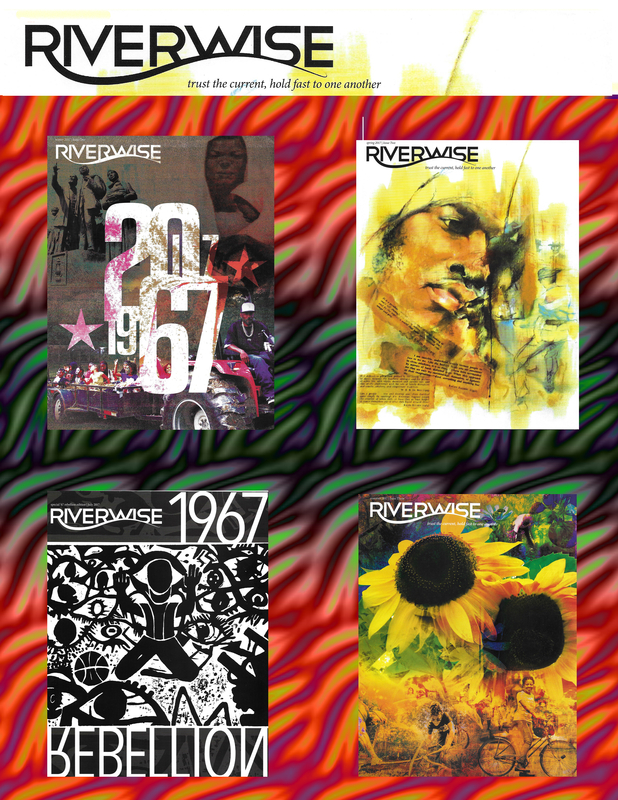 The new edition of Riverwise Magazine is out in your favorite stores and community spaces. Enjoy these reflections on a season of active imagination, seeds sown, love labored, growth, and manifestations of the work that feeds our souls! Regardless of the weather or political climate, the Detroit we are fighting for is full of life; so this edition highlights voices of radical hope. Riverwise Magazine has launched a fundraising campaign to build our capacity and to sustain our work. We are looking to raise around $9,000 with the hopes of being not only a sustainable project, but one thriving for and by the power of our emerging and converging communities. 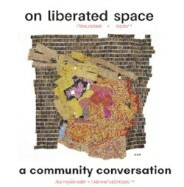 As a community and a collective, we exist to give voice to new visions for liberated life in Detroit. We beat the streets every quarter to distribute issues full of dynamic stories, political analysis, artwork, and community-centered updates. We want to grow our capacity to do necessary work as a project in constructing a new commons, building a home for our future. Expanded capacity means helping to sustain artists, writers, all content creators, and the small team that supports contributors. Growing the reach of our work also includes relaunching our website as a resource of accessibility for our readers and our community. Riverwise Magazine is growing: we are growing our story-telling capacity, a digital commons, our community spaces, and growing new voices and a new vision for Detroit’s future; Riverwise’s growth includes you! Keep current with updates about Riverwise, forthcoming issues, & the growing of our digital commons onTwitter, Instagram, and Facebook! We’re growing community resources: a calendar, a conversation series, & a newsletter. Share info or announcements with usriverwisedetroit@gmail.com. Copyright © 2017 Riverwise Magazine, All rights reserved.